I was asked today if being a mom was what I had imagined it to be. I said that it is so much more! I feel happiness, sadness, frustration, joy, love and about a million other emotions deeper than I ever thought possible. I love God more than I ever have, and I praise Him as often as I can for giving Link to us. Except for the I’m-so-tired-but-I-refuse-to-nap moments and the 3am hunger cries, Link is a very happy baby. He loves , loves, loves his daddy. Justin makes him laugh all of the time, receives countless smiles, and provides challenges to him daily. Lincoln’s aunties are the best! He loves when his Aunty Ashley watches him! She is an expert at getting him to nap and loves him in a beautiful way. His Aunty Amy doesn’t get to see him as often, but that doesn’t matter to Link – he loves her immensely! Link loves his grandparents! He looks forward to each day his grandmas get to watch him! And his grandpas always show him new things – Grandpa Mike will teach him to fish this summer and Grandpa Ron will show him all about cool cars (and is continuing to teach him the importance of the Nebraska Huskers!). Link loves to take baths and splash around! He thinks the water is just fantastic! I purchased his swim diapers and a cute little swim suit so that he is all ready to experience swimming! I am sure we will be visiting the Benson’s pool often this summer, so he is going to be quite the little fish! Lincoln is also turning into an expert crawler! He loves to chase mommy, daddy and the kitty. We all enjoy it, except for our kitty, Alabaster, who has taken to attacking Link. This means a little smack to the face, which we usually stop before Alabaster hits him, and Link really doesn’t notice. (Alabaster is declawed.) Link loves to pull kitty’s tail, but is learning how to “touch nicely”. We will see how soon he catches on completely! And who can blame him – kitty tails are fun! I am sure Link will be walking in no time. He crawls like a pro, and is walking along everything. He walks down the hall holding our hands, and sometimes does it one handed. He will be a pro walker in time for Amy’s wedding in August! 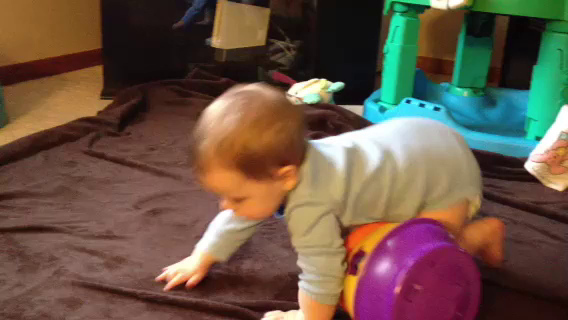 Here is a short little video of Lincoln crawling!